Reason for Reading: From first-flip I could tell this book had a huge ‘wow’ factor. Synopsis: What do women in their 20s and 30s think about themselves? How do they view the world? How is life different for them than it was for their mothers and grandmothers? How does the place they live impact all of their opinions? 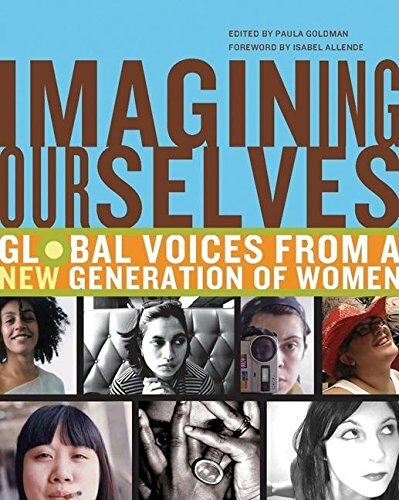 Imagining Ourselves is a diverse collection of essays, poems, and artwork from young women all across the globe which attempts to answer these questions and many more. Why you should read this book: No kidding about the ‘wow’ factor – this is a book to share, display, and provoke discussions. To fully describe this collection, I could use a dozen adjectives for each contributor – everything from powerful, honest, heart-breaking, conflicted, beautiful, painful, brave, terrifying, and everything in between applies to the book. There is one thing that ties it all together, no matter what form of media each woman has chosen to use, what walk of life she’s from, or geographical location she resides in: hope. It’s also fantastically inspiring to see what women around the world are doing and thinking, and to think about how much we all have in common, even when our circumstances seem so different from the outside. The book isn’t 100% perfect, but it’s got enough going for it that I’m sure it’ll be on my top ten list at the end of the year. Why you should avoid this book: The one problem with having such a diverse collection is that there’s bound to be a few things you don’t like. Of course, maybe you’ll decide that pushing the borders of your norm isn’t such a bad thing. And, I’ve got to admit, I was a little disappointed that Zadie Smith’s contribution was an excerpt from her book White Teeth and not something new. The Imagining Ourselves project began in the fall of 2001, during a casual breakfast conversation with a friend. I was twenty-six years old, freshly minted with a master’s degree in public policy, full of dreams about making a difference in the world…but jobless, broke, and utterly lost. The women of my generation are living a moment of mutated concepts. They don’t want unhappy marriages, but they still cry about not accomplishing Cinderella’s dream of living happily ever after. They don’t condemn themselves for having a forbidden love affair, but society still condemns them. They feel guilty for leaving their children to go to work, but they still want to teach them, by their own example, to struggle for what they wish for. Some of us with the luck of the draw – born in the most auspicious place at the most auspicious time, and then fueled for any number of reasons – make that journey to the edge and poke our heads out into space. We look into territory previously uncharted by any in our sisterhood, gather courage as a cloak around our shoulders, trembling with fear or anticipation, and breathe deeply before taking the plunge. Also recommended: The Edible Woman by Margaret Atwood; Girl Sleuth: Nancy Drew and the Women Who Created Her by Melanie Rehak; Edward S. Curtis: The Women by Christopher Cardozo. Also by this author: Imagining Ourselves is Goldman’s first book. Fun tidbit: Visit the International Museum of Women’s website for input from even more women across the world. From March through June, each month revolves around a theme, April’s being women and money. Would I read more by this author? Absolutely.